All products of K & F Concept are carefully worked out and offer very high quality. We as a German dealer attach great importance to good quality and service. K & F Concept Camera Backpack Lightweight construction The flexible, easy and safe travel companion. 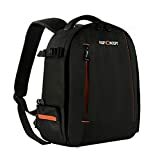 The camera backpack is perfect for your DSLR camera and laptop. So you have camera and editing device even on the move. With the versatile backpack you can transport all the accessories you need for the perfect photoshooting. Thanks to the high-quality workmanship and the sophisticated design, it meets the highest demands and makes the backpack a perfect companion. It is very flexible and offers you many different compartments for all accessories, if you do not want to use it for photography alone. This photo backpack convinces by its perfect workmanship and shines with its visually appealing design. All seams are neatly processed and the zippers are light weight and resistant. The carrying straps are comfortably padded and easily adjustable. They have a transverse belt that goes over the chest. The padding of the backpack is sufficiently thick and protects the photo equipment perfectly. Perfect protection and high wearing comfort The rugged black outer skin of the backpack is made of polyester / nylon and protects your camera equipment from wind and weather. Thanks to the Velcro separation pad you can adapt the interior to your equipment. The main compartment is divided into three rows. These are divided by Velcro adjustable cushioning elements into a total of 9 compartments. The camcorder pocket offers enough space for a DSLR or mirrorless system camera, 3-4 lenses, a flash unit and other small accessories. In the upper main compartment, two compartments are integrated, into which one e.g. A 10 inch laptop fits. The pre-attached mesh pocket, which is secured by a zipper, could take small parts . On the outside, there are also brackets for attaching a tripod. This entry was posted in Discount Photography and tagged Backpack, Camera, Concept, DSLR, Lightweight by Ball Photo. Bookmark the permalink.